I spend a lot of time on trails. It’s safe to say that I spend more time on trails than with my friends. 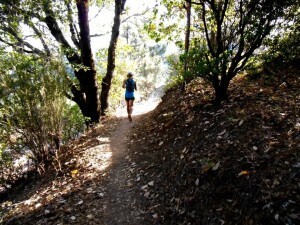 My husband says I spend more time on the trails than with him. He may be wrong, but I do understand that we’re in a kind of open relationship: I get to have weekend flings on the side, with a number of intriguing, rugged characters. Does it really matter that they’re trails instead of people? My relationships with them are complex, just like with humans. Some of them remain casual, while others deepen over time. Sunset dates with my favorite arroyo still happen, just not as often as they used to. For example, the Arroyo Chamiso is my old flame. 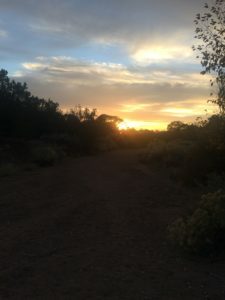 When I used to live in Santa Fe, this gem of a trail waited for me right outside my door. It was love at first sight. We were inseparable until I moved away. Now, we spend a passionate couple of hours together whenever I’m in town. There are times when I drive through Santa Fe without any intention of going for a run, but can’t resist the urge to exit the freeway for a quick few miles down memory lane. Everything feels so familiar: the underpass at mile 2, the gnarled oak tree a little further up, the rusty old Ford truck sinking into the sand. I know every rock, every cactus, the view from around every bend. I know where I need to be at sunset to make it back without a light. In spite of knowing all that, I never get bored running this trail. 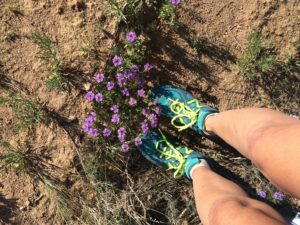 Though our paths in life have diverged, the arroyo will always have a special place in my trail runner heart. I would like to imagine the feeling is mutual. 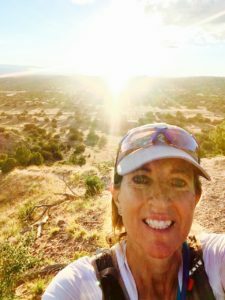 The Galisteo Basin trails, newly created just a few years ago, started out as my hot new crush. For a while, I ran them every chance I got. These trails are gorgeous, but the thrill of the unfamiliar added to the attraction. Everything seemed so perfect. I soaked up the views, explored the many possible loops. I marveled at he variety of the terrain. I did not mind driving an extra few miles to the trail head. When I got lost for an hour because some of the new loops were not on the map yet, I just smiled. It was all part of the adventure until the novelty wore off. 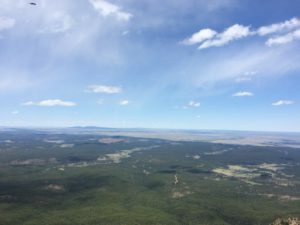 I still enjoy the Galisteo Basin, but now make more rational decisions: do I have the extra time? 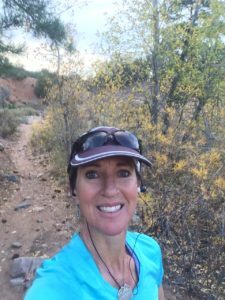 Could I run another trail closer to work or home and be just as happy? Sometimes, the answer is yes. Also, I’ve become more critical of the Basin’s shortcomings. I now notice when some of the signs at trail intersections are either missing altogether or more confusing than helpful. I love the Galisteo Basin, but I’m no longer blind to its inevitable warts and wrinkles. 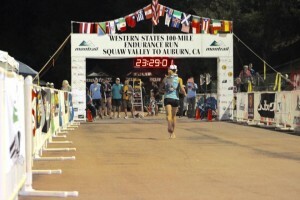 II’ve been lucky enough to run Western States twice and will run it again this June. Long before I ever set foot on this famous route in 2013, I obsessed over it from far away. I drooled over pictures, spent way too much time scrolling through race reports and race statistics, listened to more podcasts I can count, and watched Unbreakable over and over. Like my intense crush on Viggo Mortensen, which lasted until long after the Lord of the Rings Trilogy had left theaters, my Western States obsession went on for years. Unlike my crush on Viggo Mortensen, this obsession deepened into something more than a crush after we met in person: the actual Viggo Mortensen looked much older and had much shorter hair than Aragorn by the time I met him, which, for me, transformed him from the mythical ruler of Middle Earth into just another human. The actual Western States 100, on the other hand, lives up to the hype that surrounds the race. I am as excited about my third Western States as about my first, though I have experienced every mile of what lies between the Escarpment and the Placer High School stadium in Auburn twice already. One lap around the Placer High School stadium, then the finish. Epic the first time . . . and the second, and (I hope) the third. Too short, too technical – this one was a dud. I know a few of these trails. They can be in the flatlands or the mountains, single track or double, but they all sound more impressive than they are. I heard about a trail in the Villanueva State Park for years. When I finally drove out there and ran it, it turned out to be all of three miles long. I once spent several hours looking for a trail head near Mora, only to find an overgrown path with downed trees across it every ten feet. Trails that go uphill for ever and ever, promising views without delivering on the promise, are in the same category. Duds are a risk of exploring new running routes. I look at them philosophically: every trail I don’t know yet might be a dud, but I won’t know for sure until I try. But I don’t keep running the same dud every weekend because I hope it’s changed for the better. It’s not a smooth climb to the top . . .
Hermit’s Peak is a rugged beast that has left me physically beaten up and emotionally frustrated me more than once, yet I keep coming back for more punishment on a regular basis. This trail has made me appreciate the idea of switchbacks because it heads straight up a mountain where an actual hermit used to live in a cave just below the summit 150 years ago. You can’t beat the views he got to enjoy, but you have to work for them. Some trails are rocky, which makes them technical. The Hermit’s Peak trail is beyond technical. It consists of sharp, jagged rocks, with no space between them to plant a running shoe. It’s only four miles long, but those miles are punishing. Even the way back down is too steep and perilous to be runnable. So, why do I keep running this Bad Boy? Unlike any of the Duds, the Hermits Peak trail does not make empty promises. The views really are worth the effort, every time.
. . . but worth it! Sebastian Canyon is not the most beautiful of trails. It leads to a few minor hilltops with views of Storrie Lake, but nothing spectacular. Sebastian Canyon is a network of logging roads that locals use to haul wood off the mountain. They’re not designed to be recreational trails. 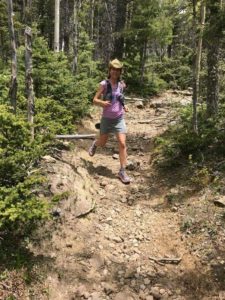 I meet few hikers and even fewer other runners there. Sometimes, kids on four-wheelers pass me. Sometimes, I find beer cans. There are supposed to be bears around, though I’ve never seen one. I have seen rattlesnakes and squirrels and wild turkeys and once, a few years ago in early March, a dead cow right next to the trail. Over the course of that spring, I witnessed the cow’s slow decomposition from carcass to scavenger food to a pile of bleached bones. 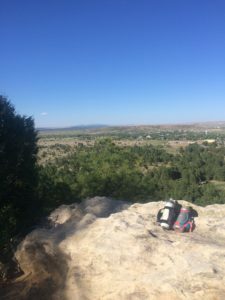 I started running Sebastian Canyon because it’s close to home, not because it excited me. And yet, I’ve come to appreciate its unique charms more and more: the mature trees, the seasonal creeks lined by red rock walls, the wild flowers in summer, the absolute quiet, the feeling of being alone in the world, far from human civilization, yet right outside my door. We’ve known each other for a long time, and we understand each other. I know Seb Canyon is not perfect, but it’s a keeper. This list is, of course, incomplete. I’ve been so lucky. I’ve run so many trails, in so many places, each with its own personality. Which trails rock your life? Please let me know! This entry was posted in Uncategorized on January 2, 2018 by silvakat. The Southwestern US is gorgeous – try New Mexico, or Southern Utah. Great post and pictures. Congratulations on your Western States successes. 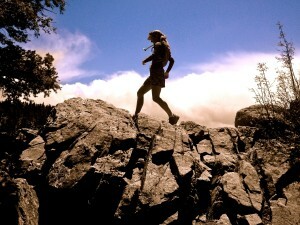 Thank you – I hope to finish another Western States this June. It’s an epic race.